Lainey sent me this item from Page Six the other day knowing it would appeal to two of my hobbies: a 20-year crush on Dave Grohl (yes, I’m old as hell) and making fun of Jeremy Renner’s nascent music career. The two were spotted talking in Vegas, which Page Six spun into a possible collaboration. Let’s pull back on this for a minute and talk about rock music. Is it dead? Or, as the NYT asked in 2016, is it just old? In a recent piece, USA Today pointed to Imagine Dragons, one of the few chart-topping rock bands, as an example of how rock music isn’t rock at all, but a combination of Coldplay, Mumford and Sons stomping and EDM-lite (I’m not the first to point out that it’s dentist office music). While the rock genre may be lifeless, we have plenty of rock stars: Rihanna, Taylor Swift, Katy Perry, Miley Cyrus, Lady Gaga, JLo, Ariana Grande, Kanye, Future, to name just a few. (I’m purposefully not mentioning Beyoncé because she does not walk among mortals.) Whether or not you like their music, these are the people creating the sounds and the stories – they are Mick Jagger and Robert Plant and Angus Young of today. In a 2018 interview with GQ UK, Dave Grohl talks about the state of punk today, saying, “Yet for my eldest daughter, Lil Pump is punk rock. In 2018, music doesn’t – and shouldn’t – sound like it did when I was 14. I guess for me punk rock is about a state of independence and if that’s Lil Pump then so be it. It’s about being free to do whatever the hell you want to do.” It’s the kids who decide what’s cool and the rest of us olds are just trying to keep up, and that’s the way it should be. Even Dave knows it. He is also very comfortable in his position as a rock elder, someone who is respected for his extensive catalogue and his prolific touring schedule. Other musicians love him and he’s played with Paul McCartney and Taylor Swift and Rick Astley – he is not a snob or a purist. Which explains why, maybe, he was entertaining Jeremy Renner? Because, musically, what would Dave Grohl do with this? 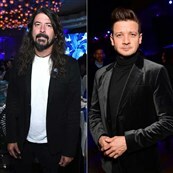 Since the 90s, every single profile of Dave Grohl mentions his reputation as the “nice guy of rock” – he’s the guy who is old school (smokes cigarettes) but not debaucherous (managed to avoid hard drugs). He’s the friendly one who drives a minivan when he isn’t on tour, so maybe he and Jeremy were vibing out about their middle-age dad lives and they made a connection. Still, would Dave be able to look over at this and keep a straight face? If so, he really is the nicest guy in music.